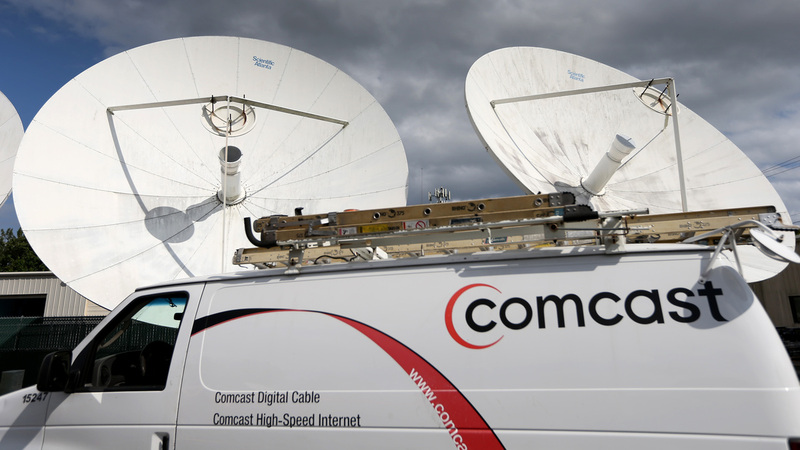 Comcast, Time Warner Cable Push For Merger Approval Amid Opposition Company officials met with regulators who are considering whether to back the proposed $45 billion merger. A group of senators say the deal should be rejected, calling it anti-competitive. Federal regulators are considering whether to approve the proposed $45 billion merger of Comcast and Time Warner Cable. Officials of Comcast and Time Warner Cable met Wednesday with federal regulators to discuss the companies' proposed $45 billion merger. The deal would create a single company that would control large parts of the cable TV and broadband Internet markets. A published report said recently that Justice Department staff members have decided to oppose the deal on antitrust grounds. But company officials are using a lot of firepower to get the deal approved. For months, federal regulators have been poring through data in an effort to assess the impact of the proposed merger. Critics, including Democratic Sen. Al Franken of Minnesota, say the merger would concentrate far too much power in the hands of a single company. "That is just anti-competitive and in my mind we need more competition in these spheres not less, and this would lead to higher prices, and fewer choices and if possible, if it is possible at all, even worse service from these companies," Franken says. Last week, Bloomberg reported that Justice Department staffers have decided to recommend that the deal be blocked. The report hasn't yet been corroborated by other news organizations and the companies won't comment. But if it's true, it would spell real trouble for the merger. Allen Grunes, an antitrust lawyer, says regulatory agencies rarely support mergers that staff members have opposed. "It certainly can happen at the antitrust agencies, but my overall view is that staff recommendations at both agencies carry weight," he says. Whatever the case, the merger talks are reaching a new stage in which the companies have to persuade regulators the deal is a good idea. That could mean agreeing to sell some of the cable and Internet properties they control. The companies have hired a roster of high-priced legal talent to get them through the process. Grunes says the negotiations are carried out in secret. "It's not transparent to the rest of the world, but in this case Comcast has got extremely good and accomplished lawyers who have a good reputation with DOJ working on it," he says. For its part Comcast says no decisions have been made and it hasn't yet been asked to make any changes in the terms of the merger. It's also rejecting claims that the deal is in trouble. But Franken says opposition to the merger has been steadily building. He says when he first started criticizing the deal his was something of a lone voice in Congress. "Most people thought it was a fait accompli, but now I think it's changed and I believe the Department of Justice and the FCC will reject this," Franken says. On Tuesday, Franken and five other Democratic or independent senators released a letter to the Federal Communications Commission asking it to reject the deal. The next months will determine whether the companies can turn the tide and persuade the government this giant merger is a good idea.